Last reviewed by Editorial Team on September 28th, 2016. What is Buspirone? What is Buspirone used for? Buspirone is a Generic name for prescription medicine that works by affecting brain chemicals that may be unbalanced in patients with anxiety disorders. Buspirone is used for the treatment of anxiety symptoms such as fear, irritability, tension, irregular heartbeat, dizziness, and other physical symptoms. Buspirone is available in the form of a tablet of 5 mg, 7.5 mg, 10 mg, 15 mg and 30 mg that should be taken by mouth. This drug should not be used for treating occasional stress associated with everyday life. Rather, doctors decide to prescribe Buspirone for anxiety disorders and short-term relief of anxiety symptoms. Xanax is a Brand name for a drug that contains alprazolam as an active ingredient which is a short-acting benzodiazepine drug. This drug works by affecting chemicals in the brain that may be unbalanced in patients with anxiety disorder. Xanax is indications are: generalized anxiety disorder, panic disorders with or without agoraphobia, and anxiety linked with depression. It is available on the market in the form of immediate release tablet in doses of: 0.25, 1, 2 and 5 mg and in form of extended release tablet, named as Xanax XR in doses of 3 and 5 mg.
How Buspirone and Xanax work in the body? Buspirone is anti-anxiety drug called anxiolytic however it seems that this drug works somewhat differently than other drugs from the same class. Though, it is not known how exactly buspirone reduces anxiety, they believe that it competes with neirostransmitters serotonin and dopamine, that are involved in causing anxiety symptoms. Pharmacologically Buspirone binds to serotonin’s 5-HT-1a receptors on presynaptic neurons located in the dorsal raphe system of the brain and on postsynaptic neurons in the hippocampus, where it blocks firing frequency of serotonin neurons in the dorsal raphe. Buspirone can also bind to dopamine type 2 receptors. Buspirone also increases firing in the area of brain called Locus ceruleus where norepinephrine neurotransmitter is found in high concentration. The final result of buspirone actions is suppression of serotonergic activity while noradrenergic and dopaminergic are enhanced. Alprazolam which is the active substance of Xanax works by binding to benzodiazepine BNZ-a receptors, which are responsible for sleep induce and benzodiazepine receptors BNZ2 – benzodiazepine receptors which are responsible for anticonvulsant activity, motor coordination and memory. BNZ1 and BNZ2 receptors are coupled GABAA receptors and increases the inhibitory effects of GABA neurotransmitter by increasing the affinity of GABA for its binding sites. After binding to its receptor, GABA opens the chloride channel, which results in a cell membrane hyperpolarization and prevention of further cell excitation. 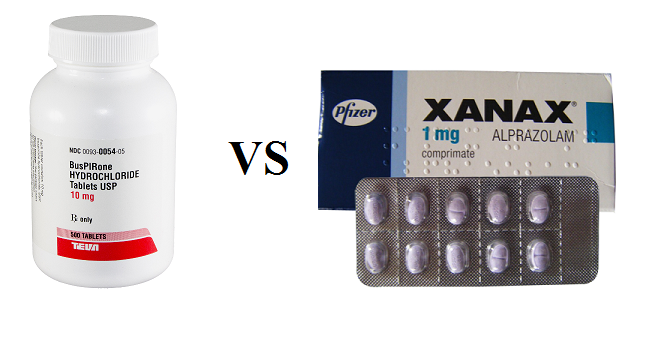 What are difference between Buspirone and Xanax? Are Buspirone and Xanax the same thing? No they are not the same. Those are different active substances. They are both classified as anxiolytic drugs however they have totally different mechanisms of action through which they express their anxiolytic effects. Xanax increases the action of GABA neurotransmitter while Buspirone reduces serotonin’s actions and enchances dopamine’s and norepinephrine’s neurotransmitter actions. Buspirone is not chemically or pharmacologically in relation to benzodiazepines, barbiturates, or other sedative and anxiolytic drugs. Also, benzodiazepines such as alprazolam (Xanax) causes addiction while buspirone not. Xanax also causes serious withdrawal symptoms while Buspirone’s withdrawal is mild. Xanax is short acting and short lasting anxiolytic drug while Buspirone is also short lasting but it is long-lasting drug. Studies have been shown that long-term benzodiazepines use is linked with dementia while Buspirone is not. Neither is known to cause a weight gain, and side effects are minimal for both. These medications do not work well with alcohol, as alcohol may potentiate effect increase the risk of dangerous side effects. However, Xanax is known as a wonder drug for anxiety, while Buspirone is known to work well for select individuals, but in some cases it much do of anything in others even at a higher doses. Compared to Xanax, Buspirone is much safer and it might be the best option for treating anxiety. There are no major unwanted long term effects after Buspirone use. Its effects may be reduced over time, but most people tolerate it for an extended period of time. Buspirone is also favorable compared to many anxiolytics because it doesn’t cause sedation in degree that other classes do. Although, body energy levels may fluctuate until body gets used to Buspirone, sedation is however not usually a major side effect of this drug. It is known that Buspirone has mildest side effect’s compared to all anxyolitics. Additionally Buspirone may improve libido and isn’t associated with any major weight gain. It also doesn’t result in slower cognitive functioning like a Xanax. Buspirone is used for the treatment of generalized-anxiety disorder since 1986.
Who should avoid Xanax and Buspirone? Patients allergic to Buspirone, Xanax or other benzodiazepines. Pregnant women. Alprazolam is classified in the FDA pregnancy category D list of drugs. That means: Studies in humans has shown adverse effects to the fetus when the mother takes the drug. This drug should only be used during pregnancy in serious cases where it’s needed to treat a dangerous condition in the mother. Patients should talk with their doctor if they are pregnant or plan to become pregnant. Doctor should tell you about the specific harm that may be done to the fetus when this drug is used. This drug should be only used if the potential risk to the fetus is acceptable given the drug’s potential benefits. Buspirone is classified in the FDA pregnancy category D list of drugs. Animal studies have not revealed any fetal damage or fertility impairment. There are no controlled data in human pregnancy. Mothers who are breast-feeding. Alprazolam and Buspirone may pass into breast milk and may cause side effects in infant. Infant may become drowsy and lose weight. Mothers who are breast-feeding should talk with their doctor, and they may need to decide whether to stop taking this medication or stop breast-feeding. Elderly (+65) and Children younger than 18 years should not use Xanax. However, studies showed that short-term use of Buspirone for no more than six weeks is safe in people 65 and older as in other adults and in children from 6 to 17 years. How long does Buspirone stays in your system? Can you take Xanax and Suboxone together?